Connect your HoloBuilder account with Procore to streamline your photo documentation process. 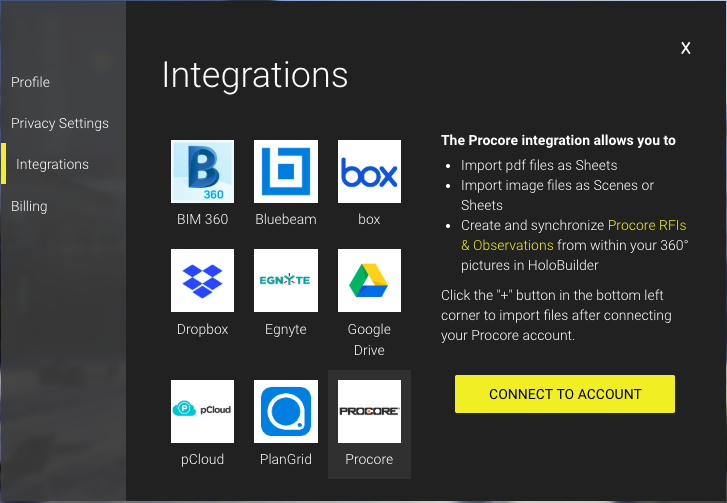 By connecting your HoloBuilder and Procore accounts you can take advantage of tools such as RFI's and importing sheets. After logging into HoloBuilder, open your account settings by clicking on your Holobuilder account name in the upper right corner and then on ‘Account’. In your account, you have access to your profile and billing information and can manage your integrations. To do so click on 'Integrations' on the left panel to see all available options. 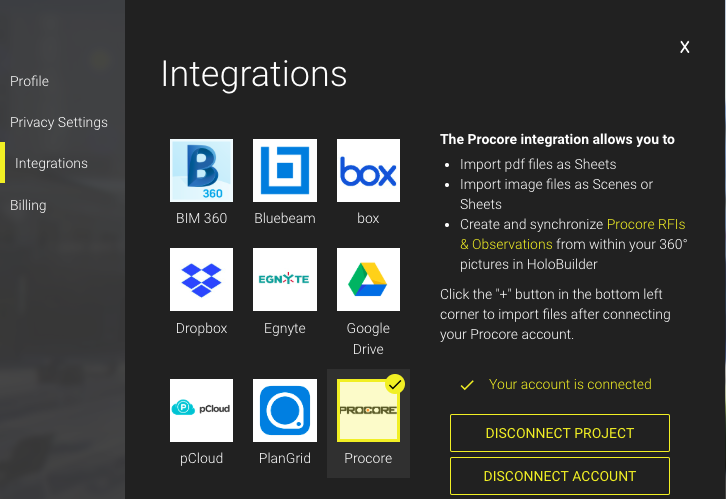 Click on 'Procore' to select within the grid of available integrations and then click on 'CONNECT TO ACCOUNT' on the right side. 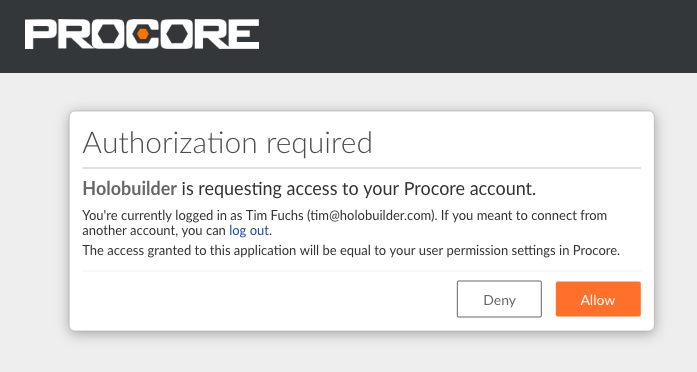 A new window will open where you have to authorize Holobuilder to connect with your Procore account. 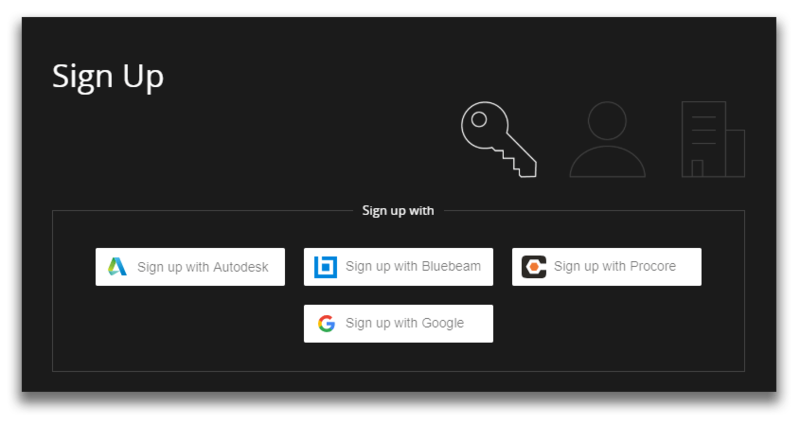 To avoid having yet another password and account to remember, you can also sign up to HoloBuilder with your already existing Procore account just like with your Google or Facebook account – no additional password required. Note: This must be done when you first sign up for HoloBuilder. If you would like to change your login settings please email us at support@holobuilder.com.